This August, ABA Publishing (American Bar Association) published Practicing Shariah Law: Seven Strategies for Achieving Justice in Shariah Courts by Hauwa Ibrahim (Saint Louis University School of Law). The publisher’s description follows. Practicing Law in Shariah Courts: Seven Strategies for Achieving Justice in Shariah Courts describes the Shariah courts of Northern Nigeria, and offers advice for counsel practicing in Shariah courts worldwide, particularly in cases involving women. In this important book, you’ll find insight into practicing law in Shariah courts, and some questions that arise from being on the field, from the authors experience of seeking justice under these laws both legally and spiritually. The introduction of new Shariah in Northern Nigeria in 1999 set in place a delicate and flexible boundary between the rule of law and individual interpretations of the Law that are unjustifiably causing individual and social ills. This important book is part of a dialogue for learning the terrain and how best to work around the disparities in the new Shariah, exploring ethical issues drawn from various sources, including the Holy Qur’an, Hadith, and Sunnah. Although their application is discussed within the legal contour of Shariah law in Northern Nigeria, the strategies are not confined to any one framework of reference and may be a valued resource to many. 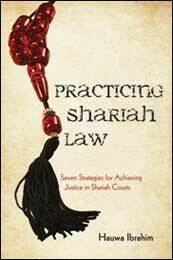 The book contains the author’s reflection of her experiences while defending clients in Shariah courts. It is a book written by a legal practitioner, sharing the strategies and resources that have served her well throughout her career. The multilayered composition of this book, weaving together Islamic law, national laws, international treatises, and religious texts is intent on providing lawyers all possible avenues for drafting a defense strategy that reflects the integrity of Shariah and upholds the values of the community. Since their implementation and subsequent codification from 2000 to 2003, Shariah law codes have been regularly amended. This book reflects the latest of the amendments known to the author. The strategies and resources outlined in this book move past them and look toward the overarching ideal of justice and fairness, placing them in a space that sustains the functional character of the work. « Things I Haven’t Figured Out — Part 3: Where’d the Framers Go?